Surprisingly, I was the first one to wake up the next morning. I groggily went over to the window to see if there had been any snow. 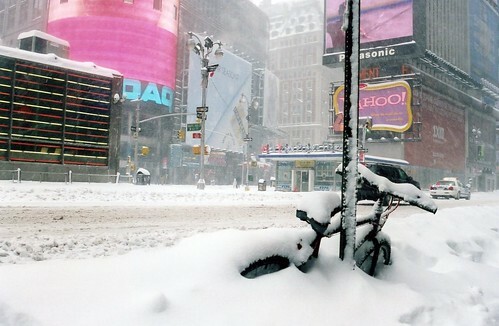 It was predicted that there would be some significant accumulation in New York, but I wasn't expecting much. I pulled back the curtains and was very surprised to see the view. 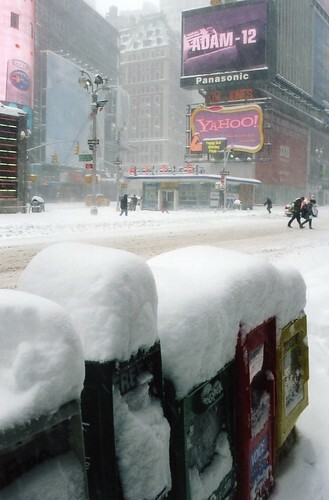 Apparently that storm system came up and dumped nearly two feet of snow overnight. 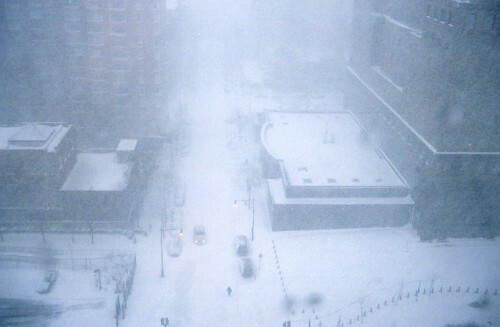 From the window, all I could see was a blizzard. 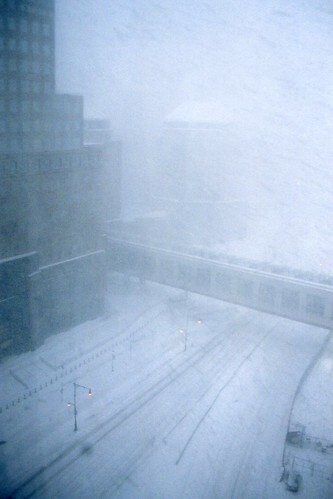 We all headed downstairs to the hotel restaurant for breakfast, and then bravely went out into the storm. It was amazing. My cousin, her husband and I are all from Arkansas. 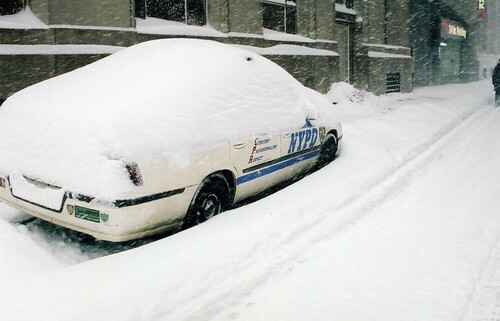 This was the most snow any of us had ever seen. If you were to take all the snow that has fallen in Little Rock over the course of my lifetime, it would hardly amount to the amount of snow out there that day. We walked around the area by the hotel, trudging through banks of snow that hadn't been cleared yet. 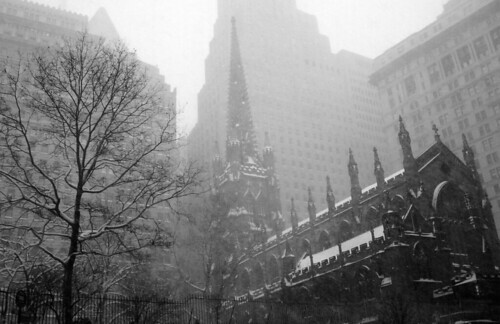 We walked by Trinity Church again, as the falling snow shrouded the tops of the nearby skyscrapers. Workers were out, trying to clear the snow off the sidewalks. 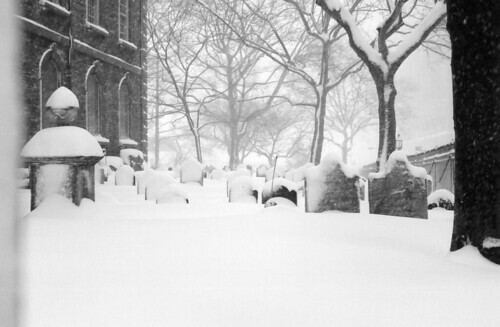 It was fun to walk the sidewalks that day. Most were cleared, but others were just paths cut out of snow, like canyons. We walked past the World Trade Center site and walked around St. Paul's Chapel. 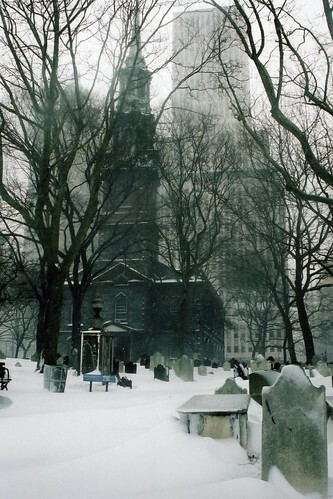 The church was built in 1766, and is the oldest standing church in New York City. George Washington used to attend services here, and even worshipped at this church on his Inauguration Day in 1789 (the pew that Washington used is still there, and you can go into the church and sit there if you like). 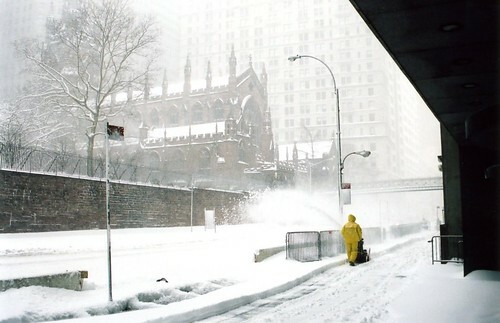 The church sits just across the street from the World Trade Center site, but it was not damaged during the attacks. After the attacks, the church was a place of rest and refuge for recovery workers. If those walls could talk - it's amazing how much history has taken place in and around that old church. 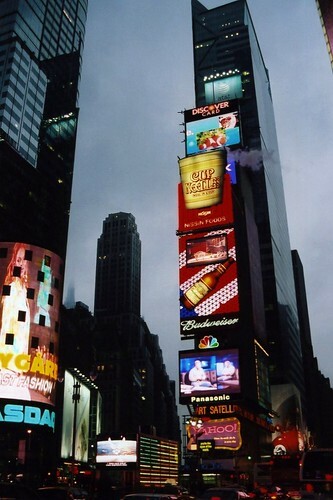 From there we got onto the subway and rode back up to Times Square. There wasn't much traffic out there, and this is probably one of the few occasions that pedestrians could stand in the roads there without worrying about getting run over. The main reason for the trip was business. My relatives had a small side-business, and it was important for them to attend a meeting that afternoon. Part of that meeting included access to a large toy fair. Now if I was 20 years younger, I would have loved going there (but then be disappointed by the lack of Micro Machines). But I got bored and snuck out to go take some more pictures. 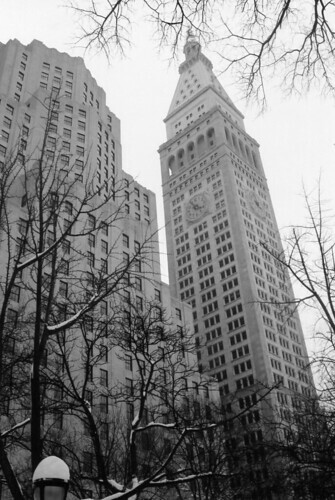 Luckily, the meeting was held in a building next to New York's iconic Flatiron Building. Which was, of course, covered in scaffolding. 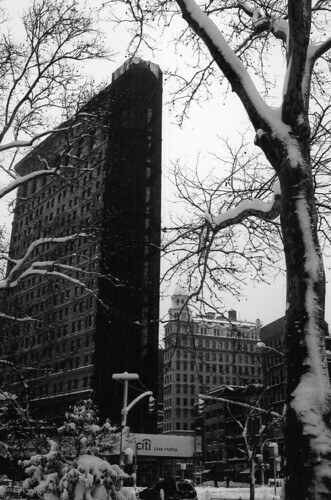 I went across the street to Madison Square Park. 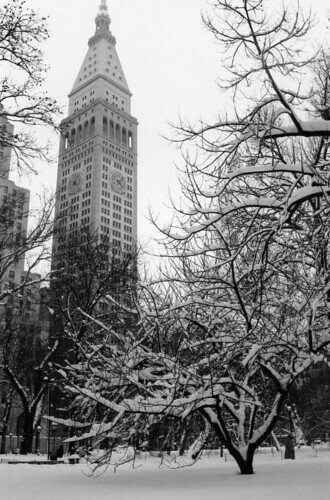 The park first opened way back in 1847, and the views there are dominated by the tower of the Met Life Building. 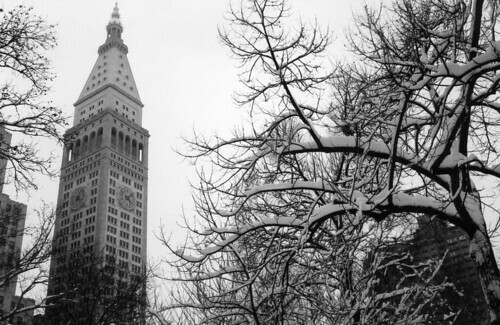 The Met Life Building was constructed in 1909, and was the tallest building in the world for three years. The park was a busy place, mostly with kids having snowball fights. 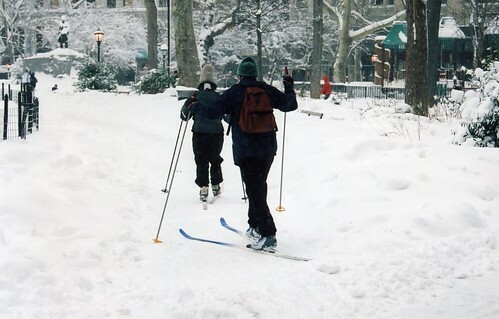 But a few people were visiting the park and trying to ski at the same time. 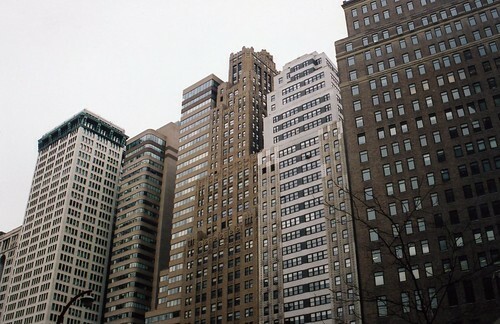 And another view of the Met Life Building. With their work done, I joined back up with my cousin and her husband. We had the rest of the day free to explore the city. 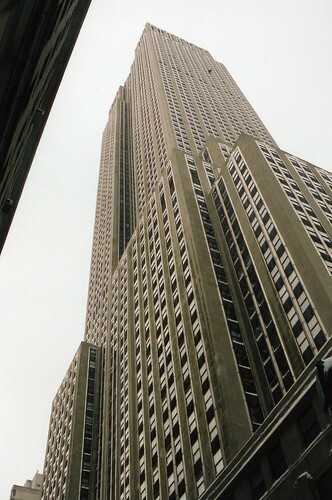 Since we could see the Empire State Building, we decided to walk over there and go to the top of the tower. It was a long walk, the Empire State Building was much farther away than what we thought it was. 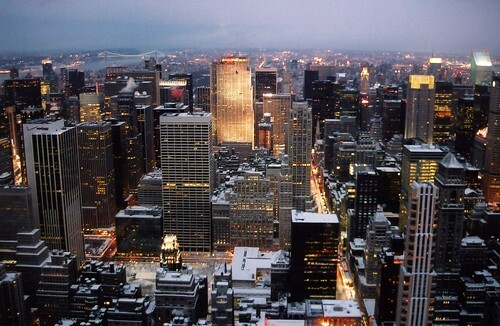 But it was nice walk, and it let us see the city. 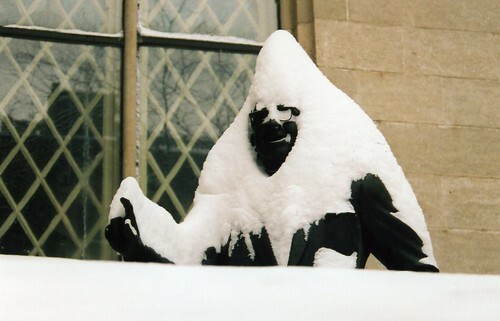 We passed by this snow-covered statue next to a church. 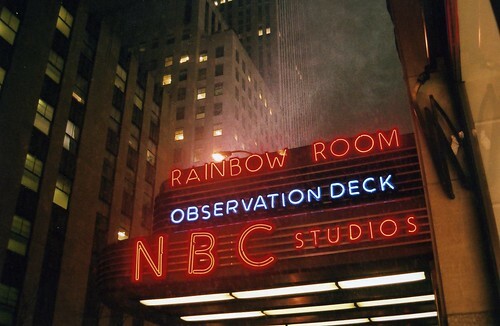 We went into the lobby and asked about going to the observation deck. The worker there actually said we shouldn't, since it'd be a waste of money. 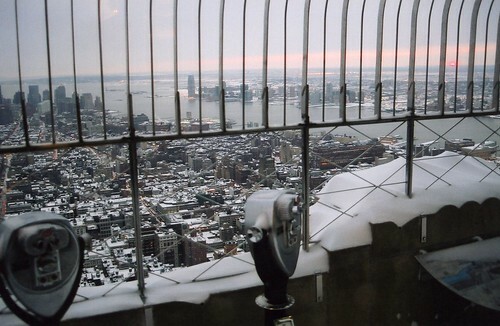 Most of the observation deck was closed because of the snow, and we were told it wasn't worth spending the $16 to get to the top. We decided to head up there anyways, since we wouldn't have time to see it otherwise on this trip. The worker took our money, probably thinking we were a bunch of suckers, and escorted us to the high-speed elevator that heads to the top of the building. Before you get to the observation deck, you must first pass through a rope maze that only makes sense when there are thousands of people all trying to get in. But we were the only people up there, except for the few workers who watched us walk by. They looked to be extremely bored, but they were nice enough to let us stop to take pictures from the windows there. We went up to the observation deck, and the outside deck was indeed closed. 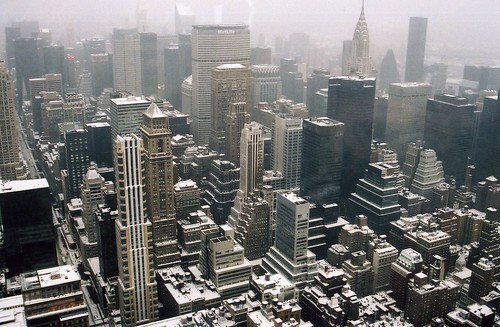 But we stood out to get some views of the snowy city. 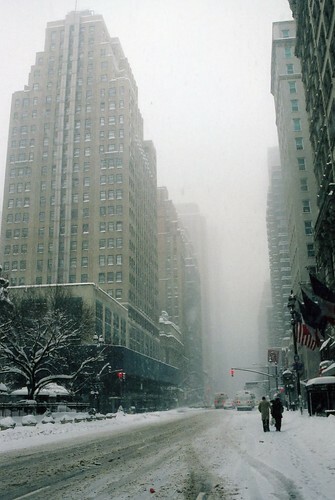 From here, you can easily see Madison Square Park and the Met Life Building. 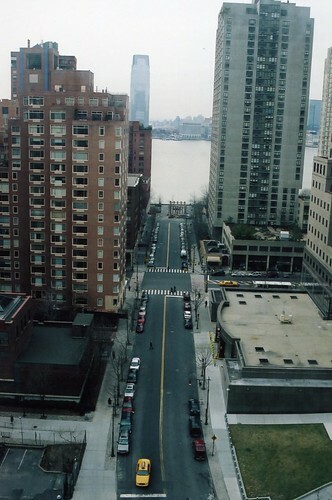 The skyscrapers of Lower Manhattan are visible in the distance. 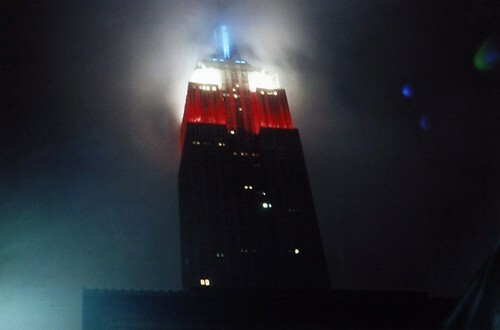 I did wonder how they were going to get rid of the snow on the top of the Empire State Building. It's not like they can just toss it over the side. The storm has passed, and the sky was clearing. There was even a bit of a sunset, as the sun finally managed to break through the clouds. From the observation deck, you have to go back down to the floor below before leaving. You again pass through a series of rope lines that lead past places for you to buy souvenirs or get cheesy pictures taken. The workers up there were bored, and didn't mind us stopping to get some more pictures of the city from the window. 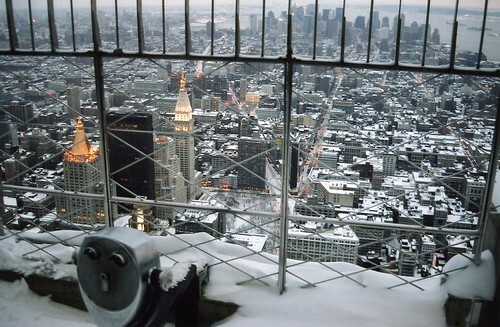 This was the view looking towards Central Park, from the 80th floor of the Empire State Building. 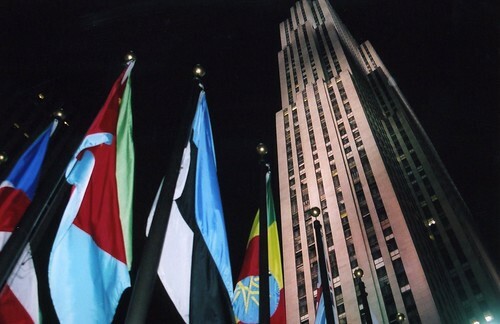 We decided to just get dinner at Rockefeller Center, where I got an expensive steak from an overpriced restaurant. The views there made up for it, since we were sitting right next to the famous ice skating rink. After eating a meal that cost me about $50, we called it a night and headed back to the hotel. 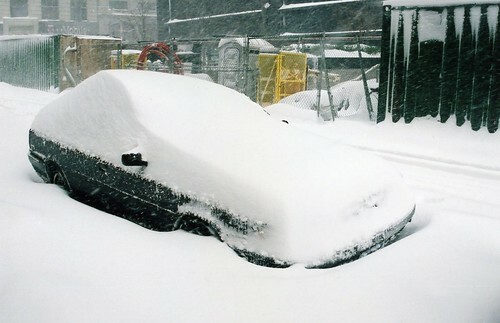 The news had this graphic showing how much snow had fallen over the weekend. Things have been a bit slow and I haven't had the chance to get out and take any new photos lately. 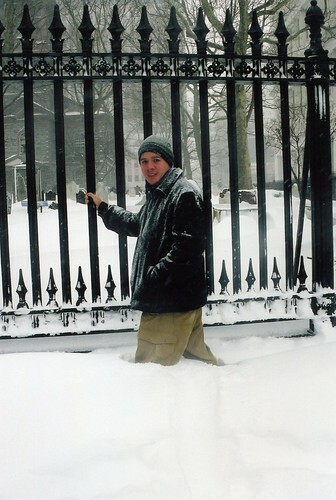 So to make up for that, I'm going to show a bunch of pictures taken during a quick trip up to New York City in 2006. That trip was done before I started this blog, so it never really got written up. But it was a great trip, even if we were there for just a few short days. I made the trip with my cousin and her husband. Like every visit I've made to a great city (like London, Paris or Chicago), this jaunt to New York was way too short to really see much of what the city offered. We pretty much went up there for the weekend, but we tried to squeeze in as much sight-seeing as possible. This trip was also taken before I had upgraded to a digital camera, so all these pictures are from my old film camera (a Pentax ZX50). I ended up going through 20 rolls of film there, and spent most of my time on the trip worrying if the airport x-rays would ruin the film before I had a chance to get them developed. But we went left early on a Saturday morning and flew from Little Rock to Atlanta, where we switched planes and then headed to New York. That flight had a lot of turbulence. The reason for that being that we were flying over a massive storm system. It wasn't all that bad, it would shake the plane a few times. But it was enough to get the pilots worried. 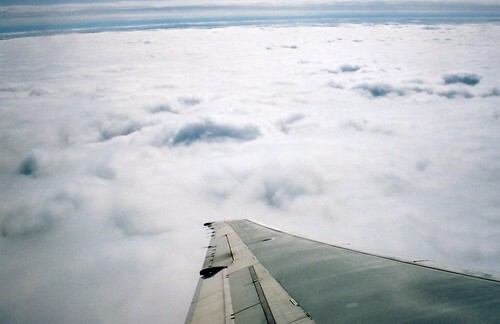 Because of the turbulence, we all had to remain in our seats with the seatbelts on. This caused a bit of discomfort with several of our fellow passengers, who needed to go visit the plane's lavatories. Since we weren't supposed to leave our seats, you'd see a few people try to stealthily stand up and then sneak up the aisles out of view of the flight attendants. They were all caught, and would be seen a few minutes later walking back defeated to their seats. A few seconds later, a flight attendant would inform us that we had to remain in our seats. Towards the end of the flight, they finally let people up and quickly tried to serve us snacks (this was back when you would get stuff like that on flights). They barely had time to hand us some pretzels before we landed. We were flying into LaGuardia, and I was lucky enough to have the window seat. 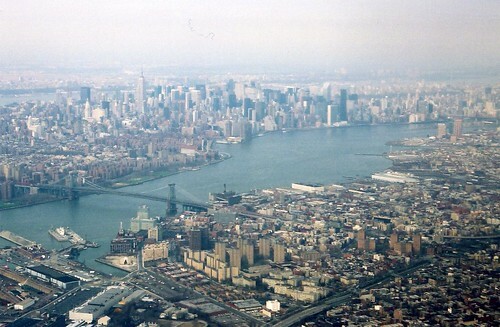 As the plane went to land, it curved around Manhatten and we were treated to amazing views. After landing, we got into a taxi and headed to the hotel. I was just tagging along with my family on this trip, and didn't do any of the planning for the plane tickets or hotel. But the hotel was booked through one of those budget travel websites. It was one of those sites where you say how much you want to pay and it finds hotels in that range, but doesn't tell you exactly where it is. So our hotel was booked, and all I knew about it before was that it was "near Chinatown." I thought that would be good, since we would probably have some good meals on the trip. The taxi took us over the Brooklyn Bridge, and I was thrilled to see the city and the huge collection of skyscrapers. We all joked that you could easily tell someone is from Arkansas when they are amazed to see any number of buildings over 20 stories tall. The taxi stopped at the front of the hotel and I was shocked to see where we were. It wasn't in Chinatown at all. In fact the hotel website would have been better to say "near Wall Street" or "near World Trade Center site." 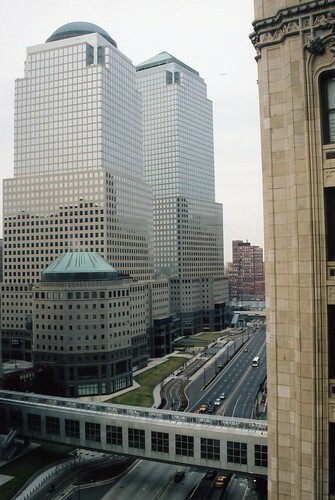 From the front door of the hotel, you could see buildings of the World Trade Center complex that had survived the 9/11 attacks. 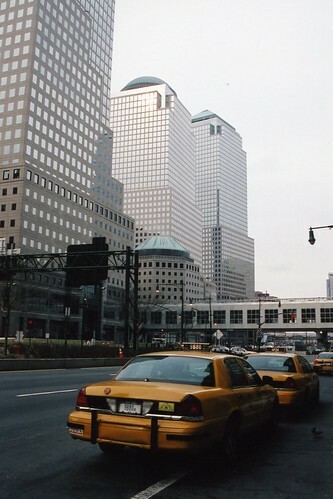 In fact, the hotel was about a block away from Ground Zero. We must have stumbled onto some great off-season rates for this hotel, because we had a room that provided some amazing views of the city. 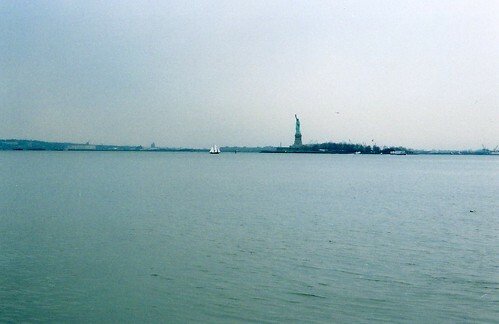 It was a corner room, and on one side was a view of the Hudson River, the Statue of Liberty and Ellis Island. On the other side was a view looking up towards the Trade Center site, with what appeared to be an apartment building next to us. We got to Battery Park only to find out that we had just missed the last ferry ride of the day to Liberty Island. After walking by some people trying to sell us Rolexes, we had a look around the park. 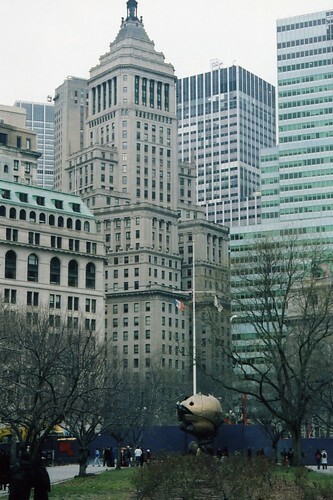 The golden sphere seen in this shot used to sit between the Twin Towers, and was moved to this spot in Battery Park. Along with the tourists, there were a good number of birds swirling about. 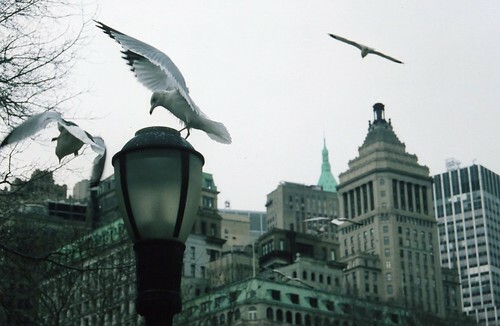 This one perched on a light pole in Battery Park. We then walked back towards the hotel, passing by Trinity Church. The first Trinity Church was built in 1698. The current church was built in 1846, with the spire being the tallest point in the city until 1890. 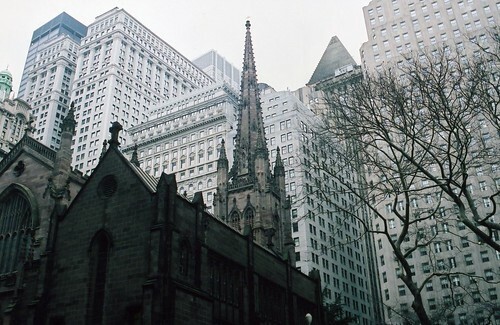 The front of the church looks toward Wall Street. From there we walked past the hotel to the World Trade Center site, and paid our respects to Ground Zero. Seeing it person sent chills down my spine. 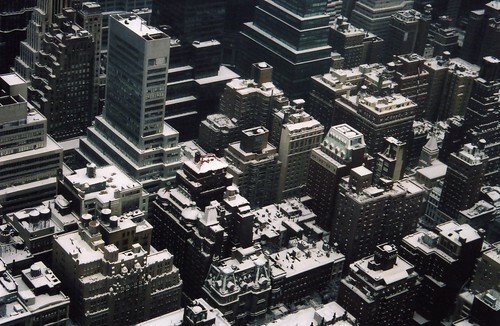 It was a huge gaping hole in the heart of the city, a deep chasm that had a deep air of sadness around it. 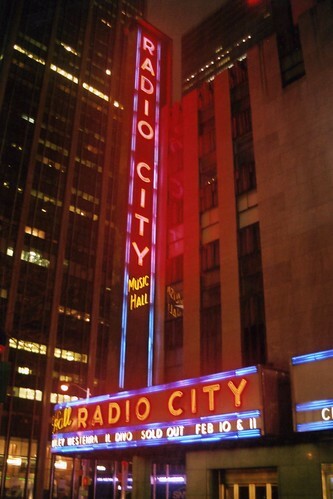 I couldn't help but to remember where I was on that horrible day in 2001. I had graduated from college in May of 2001, but wasn't able to find a decent job. So that summer I started working at the J.C. Penny's at McCain Mall in North Little Rock. It wasn't the best of jobs, but it was a paycheck that paid the rent of my tiny apartment. But I missed a good deal of work in September because a very close relative had been sick, and then passed away. The funeral was just a few days before, and I woke up that morning in a sour and depressed mood. That Tuesday was the first day I was scheduled to go back to work. Just as I got up to take a shower, the phone rang. It was my brother. He was working in an office in the TCBY Tower, the tallest building in Little Rock. He told me that something bad was going on, but there weren't any TVs in his office and he wanted me to turn on the news to give him an update. I naively asked what news station was covering it, and he replied "probably all of them." So I turned on the TV and watched with horror as that morning's events unfolded. I relayed the bad news to my brother, until he told me that his building was being evacuated due to safety concerns. I hung up the phone and then headed to work. So I drove to the mall to go to work. Usually there was a morning meeting, where the manager would discuss which department had the best sales. But that morning, everyone sat in a stunned silence around a TV set. Several people were crying, and no one knew what to say or do. It came time to open the store, and we all went out and stood behind the cash registers. Usually mornings were quiet, but the store was eerily silent. 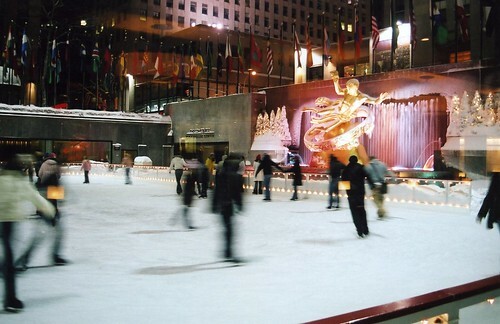 It is impossible to think of what it was like to have been in New York on that day. 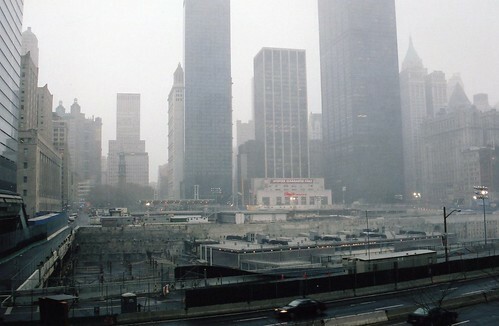 It was eerie to walk through the streets that were once filled with panic, and then covered in the thick dust and debris after the towers fell. Ground Zero looked like a construction site, and if you didn't know any better you might not be able to tell that anything terrible had happened there. It reminded me of Civil War battlefields, which when viewed in present times are nothing but empty fields that hardly reflect the destructive events that took place before. 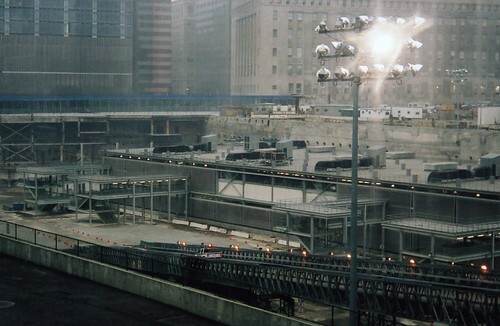 The area around Ground Zero has returned to life, with just the empty space of Ground Zero and the shrouded Deutsche Bank Building still showing great evidence of the attacks. The 42-story Deutsche Building was heavily damaged during the attacks, and is in the process of slowing being deconstructed. The building was covered in a black netting, which we could see from the window of our hotel. I tried to see the footprint of where the towers stood, and then imagine how high and mighty they once soared. We walked around the perimeter of the site, and I was dismayed and angered by some of the other people there. There were groups of tourists, lining up and smiling shamelessly while getting their picture taken with Ground Zero in the background. Several people walked around selling cheaply printed books with pictures of the attacks. The worst was a woman who sat on a blanket with pirated DVDs in front of her. While I do enjoy watching movies, I don't think this was the best place to try to get people to buy copies of the "40 Year Old Virgin." 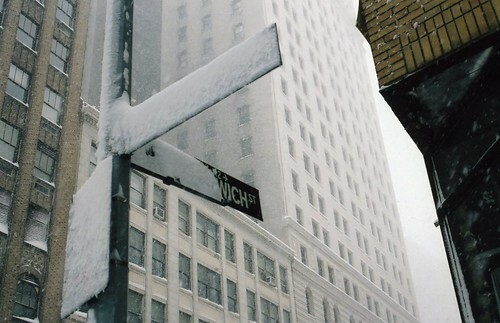 It started to snow while we were at Ground Zero. 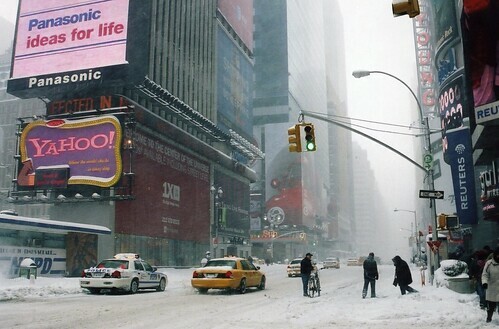 The weather people had predicted that there was a strong chance of snow while we were in New York. The big storm that we flew over was just now moving into the city. While it was certainly cold out there, the snow hadn't started to stick yet. 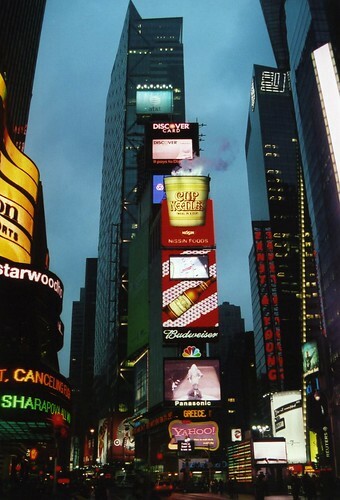 We got onto the subway and headed over to Times Square, just as dusk settled over New York. It was busy, but somehow smaller than what I thought it would be like. At the time, I was working in the broadcasting industry. But I don't think I could have gotten in there, since I was working for a PBS affiliate then. 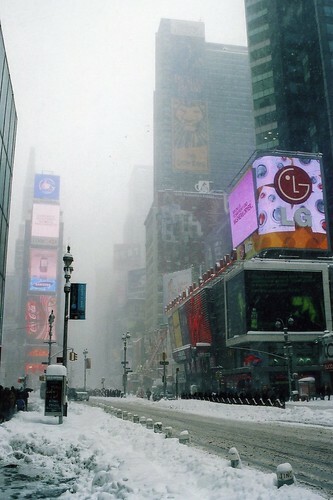 The snow was coming down harder, and we heard talk that it was going to be a huge storm. It wasn't sticking yet, and I didn't think it would do much. 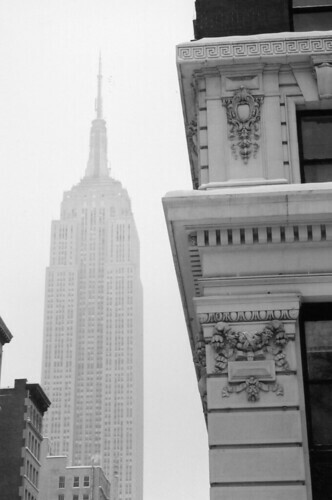 This is the Empire State Building, with snow billowing around it. After a bit more time exploring the streets, some snow was finally beginning to stick along some plants along the sidewalk. 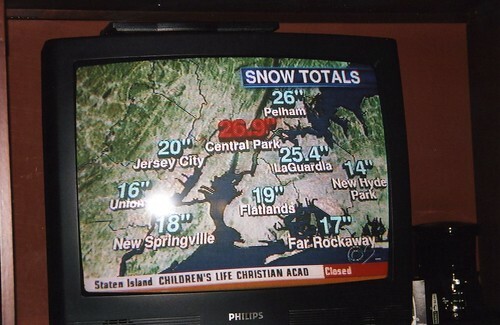 Later, when we got to the hotel, we turned on the TV and saw the weather people were predicting significant levels of snowfall. 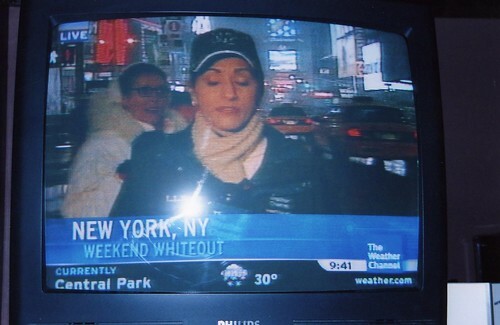 They were calling it a "Weekend Whiteout." I laughed at that, saying that it's silly that there is going to be all this snow when it's just barely sticking. I was accustomed to Arkansas snowfall, where dire snow is predicted that ends up being nothing more than a light dusting, if that. 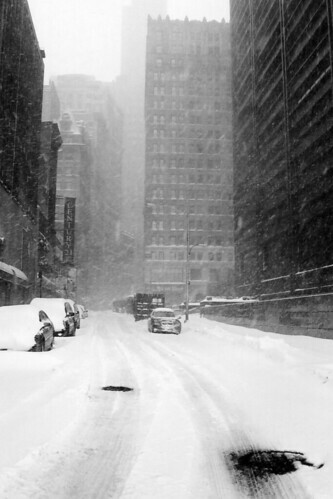 We went to sleep that night not worrying much about the weather, or any "Weekend Whiteout."